Consistent withGB/T9138-1988 standards and JJG817-93 statutes and JGJ/T23-2001 technical regulations. HT-225 Concrete Test Hammer generally applied to building components, bridges and all kinds of concrete components ( panels, beams, columns, bridges ) strength. 3. Pointer slider with external spring ring structure, both convenient for the friction adjustment, and ensures that the pointer shaft and pointer slider friction uniform, to ensure the accuracy of the instrument. 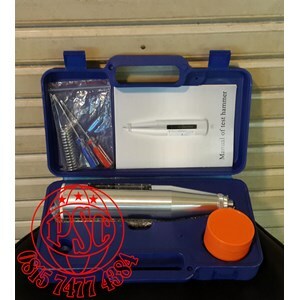 Peer-products is relatively high accuracy, quality and cheap, long service life. Consistent withGB/T9138-1988 standards and JJG817-93 statutes and JGJ/T23-2001 technical regulations. This product is suitable for supervision of the company, quality supervision on-site sampling tests, as well as testing centers. On-site automatically assessment results and print, without manual calculation. 7. Easy to operate, the software set the upper and lower rebound values, the outliers can be automatically removed. 8. Test hammer using imported parts, mechanical parts machining high precision, long service life. Superior price than the market peer-products. 255 * 100 * 16 = 408000 testing results, 20 special test strength curves could also be requested to add of their own. 4 AA alkaline batteries, 20000 times test.